One of the most important movements in golf is the squat position. You set up in a squat position at address position and then you want to maintain that squat throughout the swing. As you approach impact, you use the energy that has been stored up from loading into your squat to transfer to the ball as you push off the ground and shift your weight towards the target. Improving your squat will improve your power. Watch Karen Palacios-Jansen demonstrate this exercise. To squat properly, you need leg strength. Leg strength will also help you transfer body weight onto the lead leg and to extend the hips up through impact. This move creates a tremendous amount of force to help create power. Squats are also a versatile exercise. They can be done almost anywhere. Doing squats can also increase joint flexibility and engage the core. Squats are important for golf and overall strength in legs, glute muscles and core. Standing in shoulder width stance, using a club as balance. Squat down as you keep your arms extended. Keep your spine relatively straight as you maintain your knees over your toes. Try to squat down so that your thighs are parallel to the ground. In my opinion, daily practice is the key to success towards any goal. Making 10 practice swings a day or exercising for 5 minutes everyday will get you playing better and in better shape than exercising or practicing for two or three hours once a week. 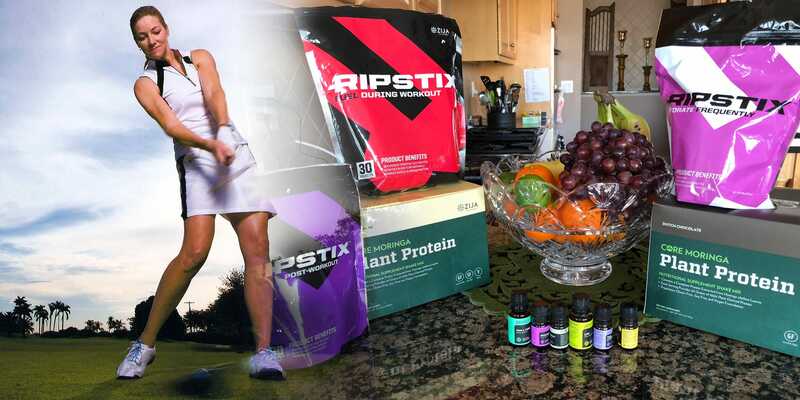 First of all, it is always hard to find big chunks of time to do massive workouts or beat balls on the driving range. Secondly, the long workouts and practice sessions usually lead to fatigued swings, injuries and ingrained bad habits. Simply taking practice swings can help you develop feel for the correct positions in the golf swing. As you place your hands on the club, try to simulate your real grip and set-up as much as possible. Swing the club, feeling the weight of the clubhead, to develop feel, tempo and strength. Visual a smooth swing and see your ball fly down the fairway. Use the Cardiogolf ‘Shortee’ Clubto practice everyday. If you don’t have room to swing a regular golf indoors or you can’t make it to the golf course or driving range, use the Cardiogolf ‘Shortee’ Clubto practice anywhere and at anytime. Place your lead hand on the club. Adjust your hand until you are in a comfortable and neutral position. Place your back hand on the club. Adjust your hands until you are in a comfortable and neutral position. Grip and re-grip the club several times until the position feels comfortable. Spend 3 to 5 minutes placing your hands on the club everyday until it feels natural and comfortable. 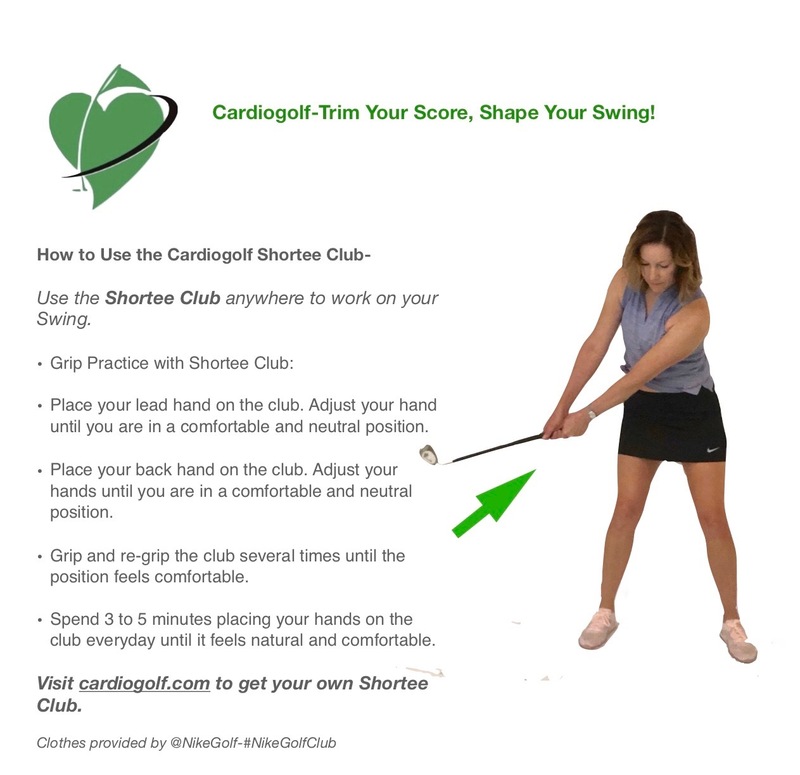 Visit Cardiogolf.comto get your own ‘Shortee’ Club. Simply taking practice swings with one arm at a time can help you develop feel for the correct positions in the golf swing. As you place one hand on the club, try to simulate your real grip and set-up as much as possible. Swing the club with one arm, feeling the weight of the clubhead to develop feel, tempo and strength. Benefits of the lunge exercise include developing strength and firmness in your lower body. The extension part of the exercise strengthens your arms and core to help create power in your golf swing. As you lunge forward, keep your arms parallel to the ground, hold position for a moment. Set up to hit a shot.Swing to the top and then swing down to impact. If you top shots, most likely you are standing up as you strike the ball. Ideally, you want to keep the same angle your torso and legs formed at address position the same throughout your swing. Many high-handicappers stand up (straighten their legs or lift their torsos) as the they strike the ball resulting in an array of bad shots including thin and topped shots, pulls and slices. If you take a look at professionals, you will see that they keep their spine angle through out their swing and even many squat down as they strike the ball.